Happy 4th of July from Fabulous (and newly historic) Glenbrook Valley! So its like 1.2 million degrees out and I’m feeling patriotic. While most people are outside getting their BBQ on, I’m thinking I need something a bit more climate controlled………. Shopping! What could be more patriotic or American than spending our hard earned dollars to support local businesses? 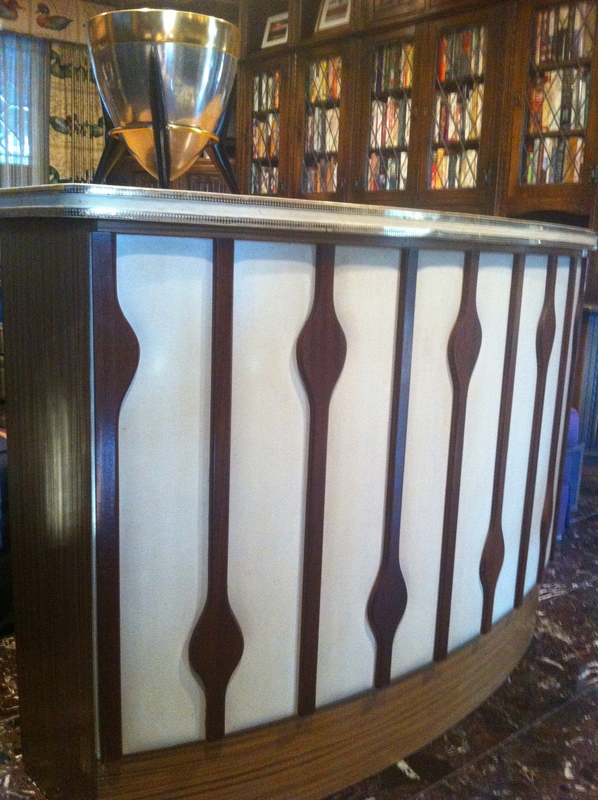 We bought a bar. Its just resting in the library until its home has been cleared out by the Salvation Army (also a patriotic move). Next up we have what I am calling a cookie jar. 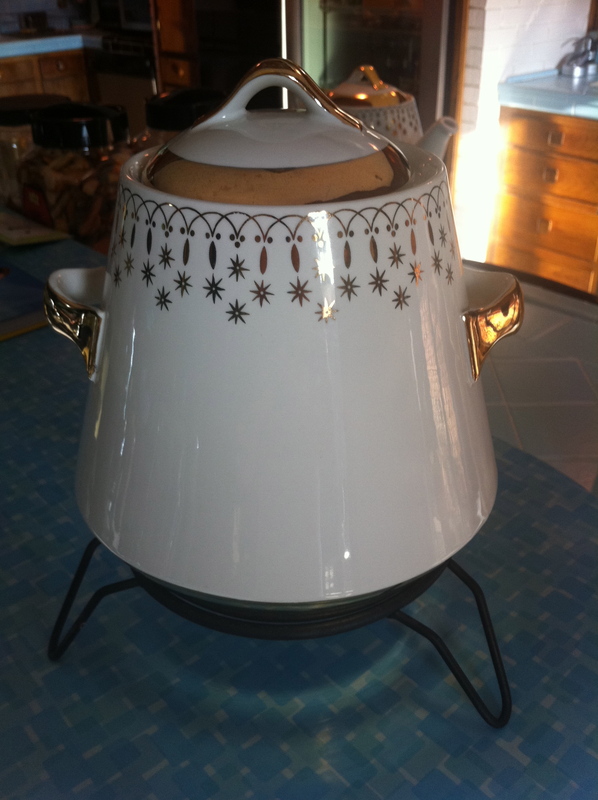 It was marked as a fondue pot. Huh? Don’t you need a heat source and forked things on a stick for that? Either way, its called Flare Ware and its from Hall China. At a completely different store we found more Flare Ware–this time in the form of a teapot. I guess we could put the cookie jar on this base and call it a fondue pot–but we would still be missing the forkie things, and where would we store the cookies? 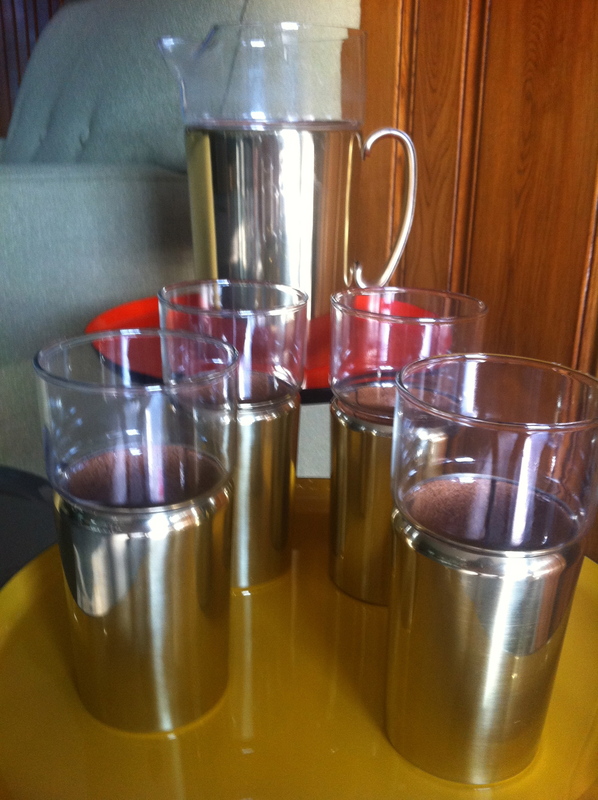 Our next shiny item is an aluminum and cork pitcher and glass set. These beauties are gold aluminum with a cork lining and glass insert. A great way to keep your Tang nice and chilly on a hot summer day. Lets call this one “The Trifecta”. 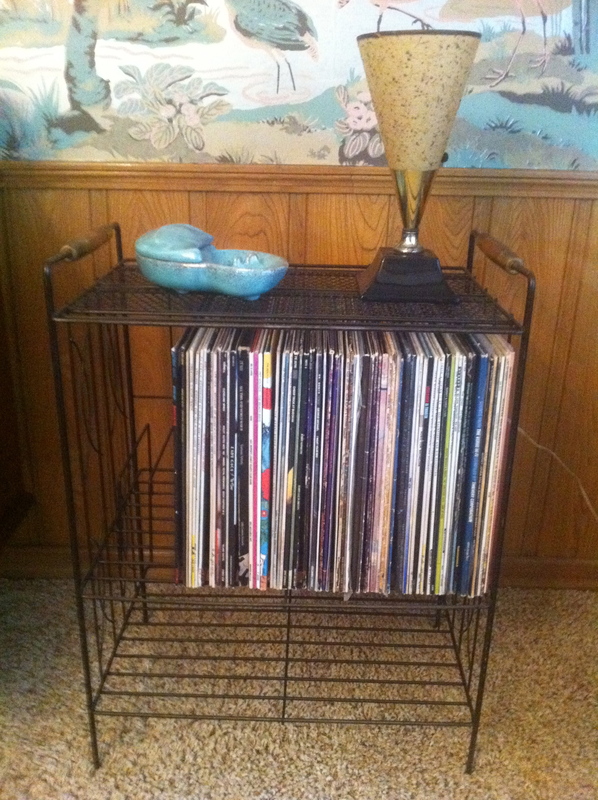 Needing more storage for our ever growing record collection, this nifty wire rack called out to us. Then this lamp with a a fiberglass shade chimed in. Not to be outdone, the covered blue ashtray added the 3 part harmony. I’m just glad they were all quiet for the car ride home. Yup. More pink stuff. 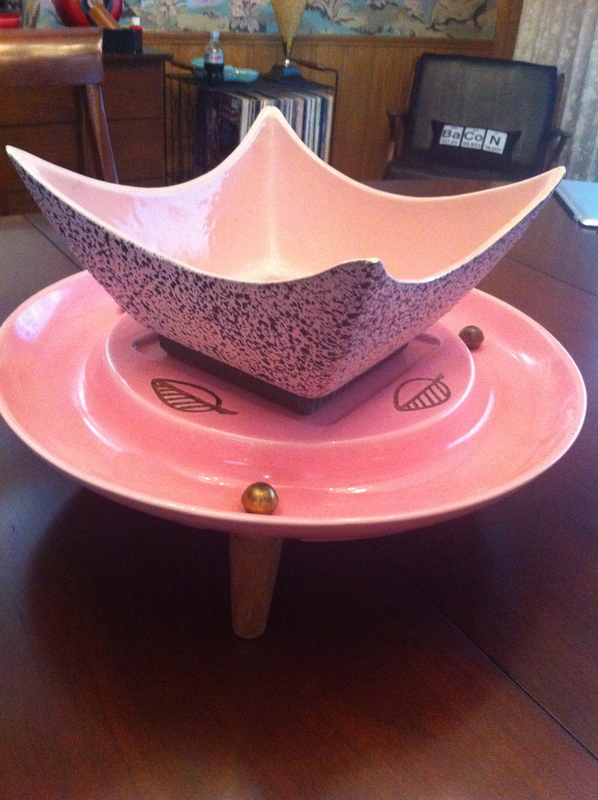 The dish matches the Shawnee pottery that we bought a while ago. The tri-legged plate is from Miramar of California. Behold the power of cheese…..plate. A Briard cheese plate, to be exact. I like that Briard sounds like a cheese. And I like that the knife is chained to the plate. You don’t want anyone walking off with your cheese knife. 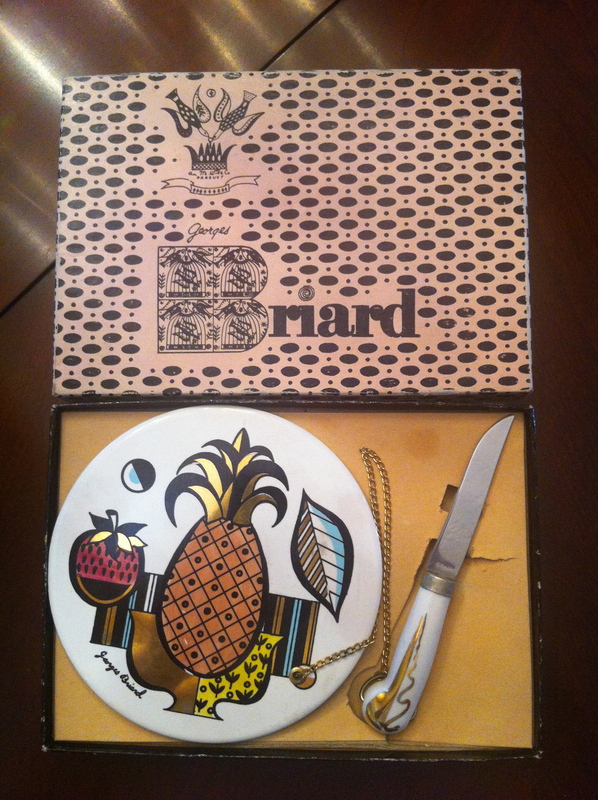 Okay, I admit it: I like the box better than the plate. There. I said it. So, what did y’all do to celebrate the holiday? I have the forkie things. Many of them. 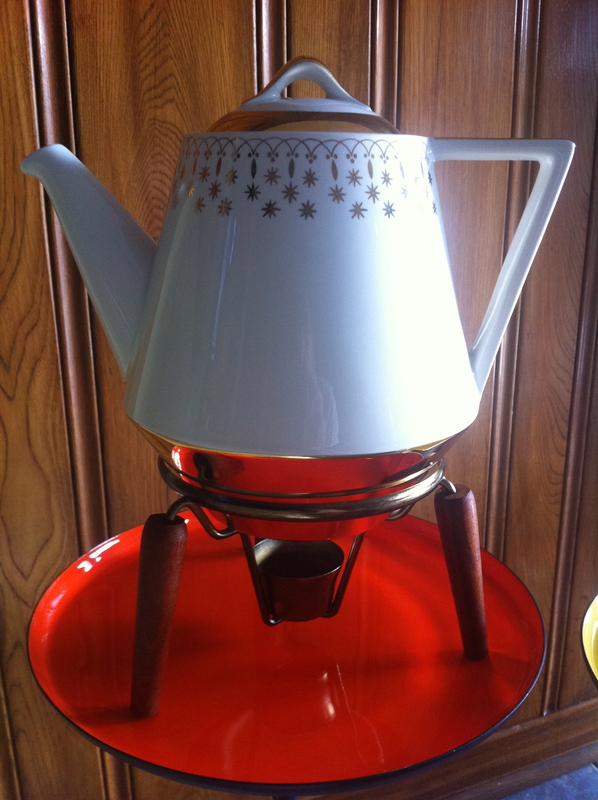 And an orange fondue pot. Cool Stuff! Wahoo! I want to go shop with ya’ll! We just purchased a very cool Eames Era art piece for our wall that matches the original mural wall paper we escavated from many layers on our living room wall. (how do you post pictures? and I will put it on here…) We are getting our house painted this week! YAY!!! On the fourth, Dave, Stefan and our granddaughter Kaelyn Jayne headed to Galveston for the day. We were recuperating STILL from way too much fun a few nights before….so we were planning on taking it easy on the 4rth! We had great fun grilling hamburgers on the beach, and watching all the rowdies drive by in BIG trucks with Train horns and LOUD music! Add to that the 4 “under-age” girls next to us who caught by the ever-present police monitoring the beach, bare chested babes (not just the man-babes), great seaside breeze, and the taste of barbecue in the outdoors….and it all adds up to a blast! Beach air and the sound of water….and this simple girl is Haaappppy!!! !